J.K. Rowling first gave us a window into her incredible imagination with the magical world of Harry Potter in 1997. Fans young and old wanted nothing more than to crawl inside the books and live in this world. Twenty years later the books may have come to an end, but the magic lives on, and being a part of it is now a reality. Pack your cloak and wand and get ready to explore the best Harry Potter experiences around the world. This award-winning walking tour is a must for Potterheads while visiting London. Immerse yourself in Harry and his friends’ world as you explore film locations and iconic London landmarks, learn what inspired J.K. Rowling, and discover fun facts and behind-the-scenes stories. The 2.5-hour tour costs £14 per muggle, and includes 20 muggles per tour, so many sure you book in advance. The moment Harry discovered he was a Parselmouth during an outing to the Reptile House in The Philosopher’s Stone was a memorable one. Explore the London Zoo and be sure to stop at the house where creatures slither and crawl to find out if you too might be versed in Parseltongue. No going through the fireplace necessary to reach Diagon Alley as all you need is an entrance ticket to awaken you inner wizard. Unless you’re a muggle, you’ll surely opt to take the Hogwarts Express over walking to Hogsmeade Village, where you can enjoy a frozen butterbeer. Go on the thrilling rides, have your perfect wand chosen at Ollivander’s, explore Weasley’s Wizard Wheezes, and dine at the Leaky Cauldron or Three Broomsticks. Sure to be an unforgettable experience for die-hard fans, this is where every last detail of Harry Potter comes to life. Those on the west coast can check out the Wizarding World in Hollywood. The Osaka version of the Wizarding World has many of the attractions as its Orlando counterpart, but one of its greatest features is touring Hogwarts while waiting to get on the Forbidden Journey, an exciting flight simulator. You’ll walk down the dimly-lit corridors where you can explore Professor Dumbledore’s office, the Gryffindor common room, and the Defense Against the Dark Arts classroom. Other highlights include Flight of the Hippogriff, a roller-coaster for all ages that takes you past Hagrid’s Hut, and Osaka’s own Hogsmeade, where you can grab a butterbeer and sample the wizards’ favorite sweets at Honeydukes. No stranger to film crews, Glencoe was the primary outdoor filming location for Harry Potter and the Prisoner of Azkaban as well as the backdrop of Hagrid’s Hut on Loch Torren. This beautiful location doesn’t only make for picturesque onscreen adventures, though. You’ll want to grab your camera and have your own little escapade as you trek through the highlands and snap some scenic shots. The Warner Bros. 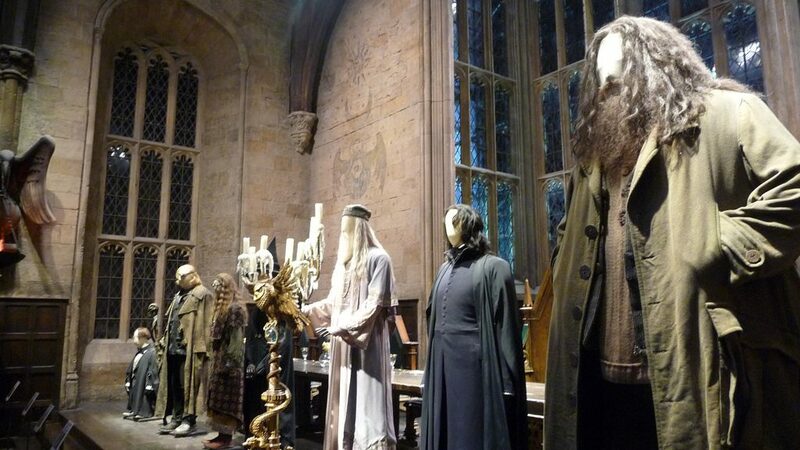 Studio Tour of Harry Potter will give visitors a new appreciation for the film adaptations. This treasure trove of sets, props, and costumes made specially for the movie has been showcased to provide an up-close and personal account. Aside from displays, you can take wand lessons, ride a broom or night bus, and learn more about the creative process that brought the book to life through interactive displays. Harry Potter enthusiasts have inevitably dreamed of spending the night in Hogwarts. The Georgian House Hotel in London allows guests to do just that, with its rooms inspired by the captivating novels. Although not officially affiliated with the franchise, this hotel has its own Wizard Chambers that feature stone walls, stained glass windows, and glowing fireplaces alongside furnishings like trunks, tapestries, cauldrons, and antique books to invoke a spellbinding feel. The best part? You access these magical rooms through a secret bookcase. Grab your favorite Harry Potter book or DVD and get cozy in the atmosphere. As well as serving some of the best coffee and tea in Edinburgh, The Elephant House seems to get writers’ creative juices flowing. This charming cafe is where J.K. Rowling spent a good bit of time working on the first manuscript while sipping hot beverages. Among other authors who have frequented this locale are Ian Rankin and Alexander McCall-Smith. Make a pilgrimage to the birthplace of Harry Potter and, we dare say, get inspired to create a work of your own. Alnwick Castle starred as Hogwarts in the first two Harry Potter films. Memorable scenes shot on the grounds include Harry’s introduction to Quidditch and Ron crashing the Weasley family’s flying car into the Whomping willow tree. Madame Hooch’s broomstick training also took place here, and thanks to the castle’s wizarding professors, you can participate in this lesson yourself on the very same spot as your favorite trio. Otherwise, enjoy the day touring 700 years of history before taking a stroll and exploring the nearby gardens and Treehouse Restaurant. It’s a lesser-known fact that J.K. Rowling spent some time in Portugal during the early stages of Harry Potter, outlining the series and beginning the first novel. Livraria Lello, known for its whimsical staircases and stained glass ceiling, is thought to have served as part of her inspiration, as she is said to have visited this shop regularly. Located in the heart of Porto, this century-old Neo-Gothic bookstore has been voted one of the most beautiful in the world, time and time again. To escape the hustle and bustle of city crowds and theme park lines while still basking in the glory of Harry Potter, dive into Scotland’s breathtaking nature. 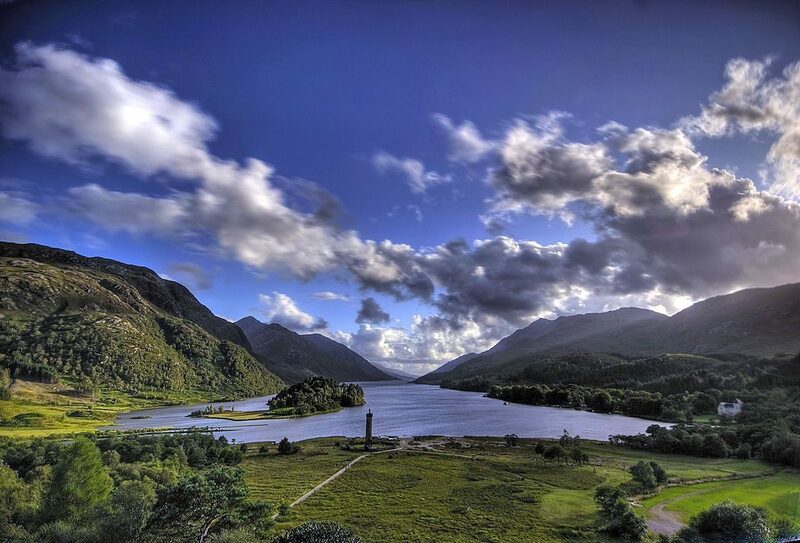 The 17.5 mile long Loch Shiel is the backdrop for Hogwarts and the location of the fictional Black Lake. Overlooking the loch is the stunning Glenfinnan Viaduct, a Victorian construction that served as the Hogwarts Express railway, and is featured most notably in the flying car scene of the second installation. This peaceful escape is a treat even for those unfamiliar with the franchise. While you’re in the area, hop on board the famous Jacobite steam train, in true Hogwarts Express style. This journey will take you through the Highlands Valley and cross over the 21 arches of the Glenfinnan Viaduct. There, you’ll be rewarded with monumental views of Loch Shiel. With a little imagination, you can visualize the exact location of Hogwarts across the way. Located near Castlemartin, Pembrokeshire in Wales, Freshwater West Beach was featured in the last installation as the setting for Shell Cottage and final resting place of Dobby. The abode was built down to the last detail on the sand dunes along the coastline, but promptly removed after filming. Still, visitors can walk in the footsteps of Harry, Hermione, and Ron at this location, which also happens to offer spectacular waves for surfing. Currently in the Netherlands until September, this exhibition has been traveling around the globe since 2009. It’s the perfect opportunity to get a close look at the costumes and various wands, brooms, and other objects that appeared in the movies. These artifacts are displayed in sets inspired by the film’s locations to create an even more authentic experience. 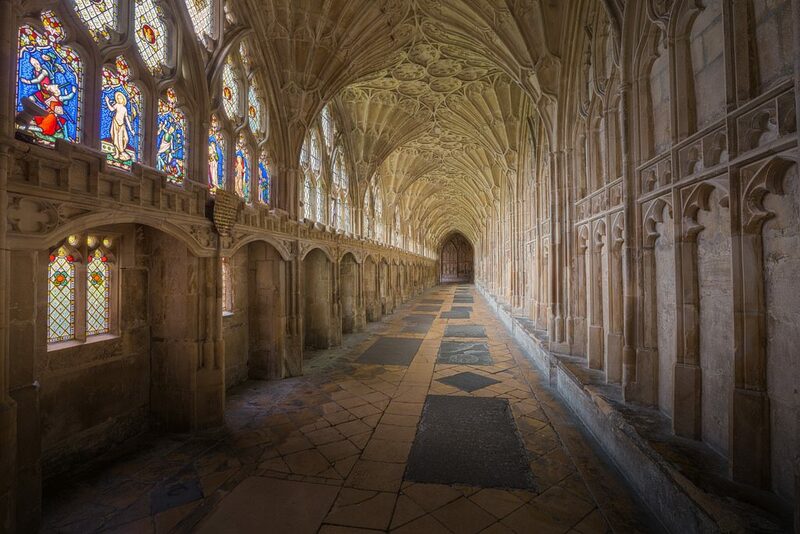 Built as a living and working space for monks, the vaulted cloisters of the medieval Gloucester Cathedral are easily recognized for their role as the corridors of Hogwarts. This Benedictine abbey appeared in a few memorable scenes, including when Moaning Myrtle’s toilet flooded, the writing in blood warned of the opened Chamber of Secrets, and Harry and Ron hid from a troll in the lavatorium. If luck is on your side, you may be able to catch Harry Potter and the Cursed Child, the play, by Jack Thorne. In this eighth Harry Potter adventure co-created by J.K. Rowling, we follow a middle-aged Harry whose son, Albus, is beginning his studies at Hogwarts. Currently playing at London’s Palace Theatre, audiences Stateside can catch the action on Broadway in the spring of 2018.